Ever since Marie Kondo’s series came out on Netflix I have had quite a few people ask me about it. For those of you that may not know who Marie Kondo is she a Japanese organizing consultant and author. Many have asked me my opinion about her method known as the KonMari method. So I thought I would share my thoughts here. Although we do the same type of work, the differences in the approach are very interesting. Ways in which Marie Kondo and I are similar. I love in the one episode when Marie said “I love mess” with that contagious grin. Something about a mess always gets me excited. I think it is because I can see the potential in the space. Knowing what the end result will be, does get me excited because I know how much more efficient and enjoyable the space will be when I am finished. I love the challenge of being able to teach someone how to control their stuff instead of letting the stuff control them. I love the fact that I can add more happiness to my client’s life. Either way, we are wanting to know how much of a positive influence the item is going to have on the client’s life and on their home. As a professional organizer, we are responsible for teaching people how to look at their stuff in a truthful way. So many times I find that homes fill up with things so quickly that the homeowner never really takes the time to review these items over the years. It is important to go through your home on a regular basis and reevaluate the items that are taking up valuable space and energy. I do assign each item “a home”. Part of the basics of any type of organization is to give each item a category and a specific place. I have noticed that both Marie and I, along with many other professional organizers, call this so-called place “a home”. It is equally important to keep all like items together in the same “home”. Ways in which Marie Kondo and I differ. I do not thank possessions before I let them go. This may be the #1 way in which Marie Kondo and I differ the most. Marie thanks each item before they leave the home as part of her practice of Shintoism. As a Christian, I have a very different outlook. I often share with my clients how important it is to be a good steward of the things God has graciously given to us. Although I strongly believe in the practice of gratitude I give all credit to my creator and not to physical things. I do not “greet the home”. According to Kondo. “I began this custom [of greeting houses] quite naturally based on the etiquette of worshipping at Shinto shrines”. If you watch Marie’s Netflix series she kneels in each home, gets quiet and greets it. I do think it is important to be mindful in our homes but I do not practice this ritual. I will say that homes do give me a feeling. I can feel when the energy is sad, chaotic, loving, peaceful or even full of the Holy Spirit. I do not wear formal clothing when I am doing hands-on organizing. In comparison to Marie Kondo who dresses in a professional manner when visiting clients, I do dress comfortably when I am working on a project. Marie’s outfits are also part of the Shinto principles. You can usually find me in work out attire or a sundress when it is nice out. I respect Marie for her own beliefs and practices. I do not spend nearly as much time folding clothes! I can not imagine taking the time to show each piece of clothing love and appreciation before I folded it! Lord knows most moms are lucky to get the clothes folded and put away each week! I do sometimes use the “filing” method for clothing that is stored in a drawer but only if it makes sense. I do not roll clothes (unless I am packing a suitcase). Regardless of the difference in our beliefs or our approach to organizing I believe overall Marie Kondo and I do have a lot in common. We are both passionate about helping people see their things differently. We want to educate people on how to live a more simpler and meaningful life. Plus we love mess! The biggest difference between us is obviously our beliefs. I think it is important to use the platform I have been given to point others to Jesus whenever I have the opportunity. I strongly believe that organization and Godly stewardship go hand in hand which I will elaborate on in my newest book and conference coming out this year. With that being said maybe I have missed the boat by not branding my own method. I love how Marie took her name and branded her method: Konmari. What should my method be? The Fordberry method? The JFBmethod? Food for thought lol! Marie’s spirit shines through when I see her on TV with that smile. She is absolutely adorable! If you are reading this Marie I hope our paths will cross someday. I am sure we would have a really meaningful and interesting conversation. Thank you for helping to draw more attention to the profession of organizing! 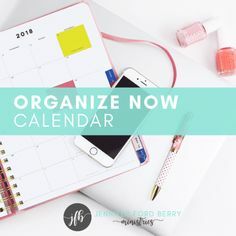 * Sign up for my Free Organizing Checklists to help you stay organized throughout the year. Hi there! 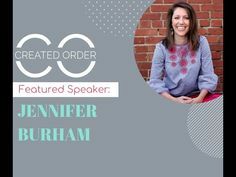 I am Jennifer Ford Berry or some people like to call me "Life's Organization Expert". I am super passionate about helping people get organized and stay that way! I have written a series of books called Organize Now! I contribute my organizing tips to National magazines, radio and TV shows. I am here to help you realize that your life is not about stuff...it is about living! YOU can live an organized, healthy and exciting life one baby step at a time. Let me show you how! 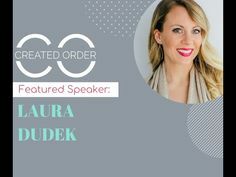 Why Charlotte For The Created Order Conference? Galentine’s Day: Are You “Too Busy” For Your Girlfriends? 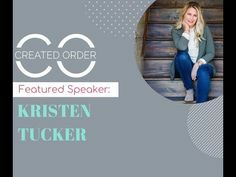 * Purchase Tickets to the Created Order Conference in North Carolina. * Purchase Tickets to the Blurry Conference for teens in New York.